And he said, What hast thou done? the voice of thy brother’s BAN crieth unto me from the ground. Yo yo yo! This is J to the K in Westa P-A... You know waz time its is? Bahn time fo. baN. Banned because I don't know everything, so give me a break. Banned for not knowing that everything can be found at your fingertips, and also passing up banning the cute little worm. Banned for not eating the worm. Banned because the worm does not die. Banned for stealing the (roughly) same line I was going to use. Banned for not smoothing it out. Banned for not blending in. Banned for not offering us smoothies from your blender. Banned for not having a mood ring. Banned for giving him the moody blues. Banned for not acquiring the Merry Blues. Banned for we are very soon to get to the 100th page of this thread. Banned because it's too soon. Banned because you didn't get there soon enough. Banned coz it is kewl dude! Banned for hagiographizing hybrid speciation. Banned while I eat this banh mi sandwich. Banned for a post so ... witty and so ... delicious. Banned for having a better beard than me. Banned for inexcusable disrespect of your beardly-superiors. Hey ban off and stop aping my style. Let's Dance, David Bowie style, or is that Hecma style? Should make Justin feel at home too. It's too early for dawn of the bans. Some bans are created more equal than others. I know, for I have seen... the banned zone. Why did you scrape your hair off go and get banned? Somehow you look less intelligent now. It's a ban hammer! A BANNN HAMMMERRRR! Take your stinkin paws off the keyboard your darn dirty ape! You finally did it! You blew it up got yourself banned! God forgive you! God forgive you all of it! I can handle this gun ban, and I'm a pretty good shot with it. Would an ape make a human child's doll... that TALKED (enough to get banned)?? You're supposed to be the optimist. Look at the bright side: if this hecma that I just banned is the best they've got around here, we'll be running the place in a week. Ready your bans, lads. For tonight, we dine in HELL. Banned for banning a member with a cute avatar. Ban up soldier! Banned for not doing so. Banned for being jealous that he did not find your avatar cute. Banned for I am a jealous banner. Thou shalt have no other bans before me. 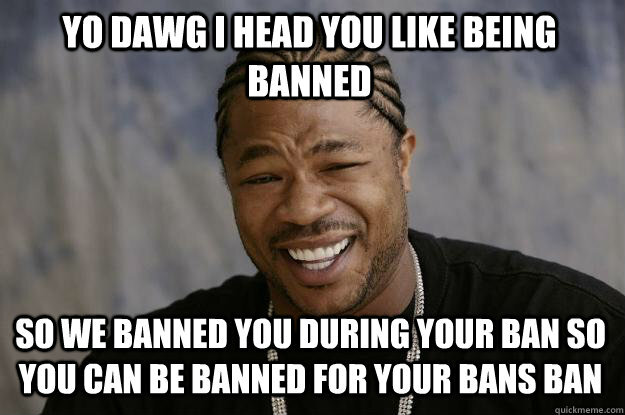 I'm sorry, that was a vain ban. Thou shalt not make your bans in vain. Thou art banned! Arise! Arise and see the light of my ban shining upon you like an oppressive, remorseless, hot and burning star of fire! For the life of the flesh is in the ban: and I have given it to you upon the altar to make an atonement for your souls: for it is the ban that maketh an atonement for the soul. You only gave two turtledoves worth of a ban when you can afford a bullock. Banned! And now art thou cursed from the earth, which hath opened her mouth to receive thy brother’s ban from thy hand. Banned for Dutchy witchcraft suspicions. Banned for Bogarting that dutchy.